A solar option like the one from Solar City isn't available in Tallahassee today. Google just announced a $300 million investment in SolarCity’s residential solar power model. This model provides an option to homeowners to install distributed rooftop solar without a large upfront investment. This option is available in different parts of the US. Google’s initial investment would pay for the system outright through a lease or power purchase agreement. A homeowner works with SolarCity to design a customized system for their roof. Past electric bills and the rate charged by the utility are reviewed and Solar City guarantees a lower rate that locks in a lower monthly payment. The homeowner does not have to pay for the design or placement of the panels, but enters into lease agreement with SolarCity who installs and maintains the panels throughout the life of the lease. For instance, if your normal monthly bill is $200, it could drop to $60 after the installation, plus $100 in the monthly solar lease, yielding a new average monthly bill of $160. The Renewable Energy Committee of Sustainable Tallahassee recently sent a letter to the Mayor of Tallahassee specifically requesting that the City Utilities look into the concept called 'community solar' which would allow distributed solar. You can read the letter here. Sustainable Tallahassee and the League of Women Voters of Tallahassee have been working jointly on this issue and the League also sent a letter to the Mayor on this issue. 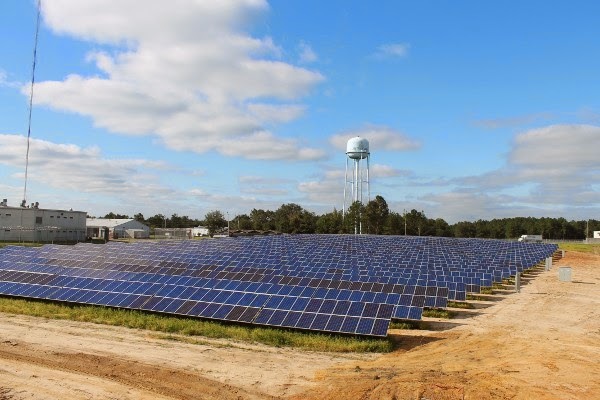 Currently in Tallahassee, we have 1.7 megawatts of solar electric production capacity. That’s less than ¼ of one percent of our total electricity production, including both city and customer owned solar arrays. However, this week the City Commission voted to move forward with a Request for Proposal (RFP) that would develop a ten megawatt system of solar power production by the end of 2016. Developing solar capacity is a much needed first step away from our current total dependence on non-renewable energy (natural gas). Details of how the City plans to develop the solar production will be outlined in the RFP. Will this system include the opportunity for distributed solar as in the solar garden or community solar concept? We'll have to stay tuned to see what develops. *for background on Tallahassee's solar efforts, read February's Greening Our Communities Blog here. The "Greening Our Community” articles are produced brought by the Capital Area Sustainability Council (CASC), a forum organized by Sustainable Tallahassee.